Public Adjusters are professionals who are employed exclusively by a policyholder who has sustained an insured loss. They handle every detail of the claim, working closely with the insured to provide the most equitable and prompt settlement possible. A Public Adjuster inspects the loss site immediately, analyzes the damages, assembles claim support data, reviews the insured's coverage, determines current replacement costs and exclusively serves the client, not the insurance company. When you are looking for the largest claim settlement you need the best Public Insurance Adjusters. 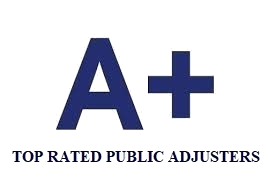 National Adjusters are considered to be one of the most experienced and professional in the Nation. They has successfully settled thousands of homeowners claims, condominium claims and commercial insurance claims.